Happy Earth Day! It may surprise some of you who don't know me in real life, but making earth-friendly choices has not always been a priority. In fact, up until a few years ago, it wasn't even on my radar. Even though I was married to a man from much more Earth-conscious Europe, we didn't even recycle. What changed? This guy. When I was pregnant with our son about four years ago, I became very interested in raising him in a healthy home. I had lost two babies before D, so my entire pregnancy was high risk. I was on some sort of bed rest for a good amount of my pregnancy, and when I wasn't watching the entire seven seasons of West Wing, I had nothing but time to think about how I wanted to raise him. One of the first green baby steps we took was to start recycling. Our city provides free recycling containers, and paper, glass, plastic, and metal recycling can all go in the same container. It really doesn't get any easier than that. We set the recycling bin just outside our garage door and started to take the few extra steps to put recyclables there instead of the trash. When D was born, I knew I wanted to nurse. It wasn't easy for a variety of reasons, but I stuck with it. When he was not gaining weight, his pediatrician supported me when I opted to pump his milk rather than supplement with formula. A grueling two weeks of nurse/pump/snack every two hours round the clock and our little boy was back to his birth weight and my milk supply was ample. On the other hand, cloth diapers was something I didn't do. It's hard to say if I would do it if I had to do it over again. I like to think I would, but I was so instantly queasy--Niels wasn't allowed to eat in the house for most of the pregnancy because I was so nauseous. D was made of mandarins and popsicles--I don't know that I would have been able to handle the cleaning. When D started solids, I started cooking, from scratch, almost every day. Over time, we eliminated almost all processed foods, and those we still buy tend to made of ingredients I can recognize and pronounce. It became a game to me as I wanted to see if I could make things myself or provide a processed-free alternative. I was very motivated to know exactly what my little boy was consuming. I learned to make all sorts of things from raw ingredients: bread, granola, salad dressing, vanilla, and other condiments, cooking spray, crackers and chips, candy and other sweets--even pop tarts! 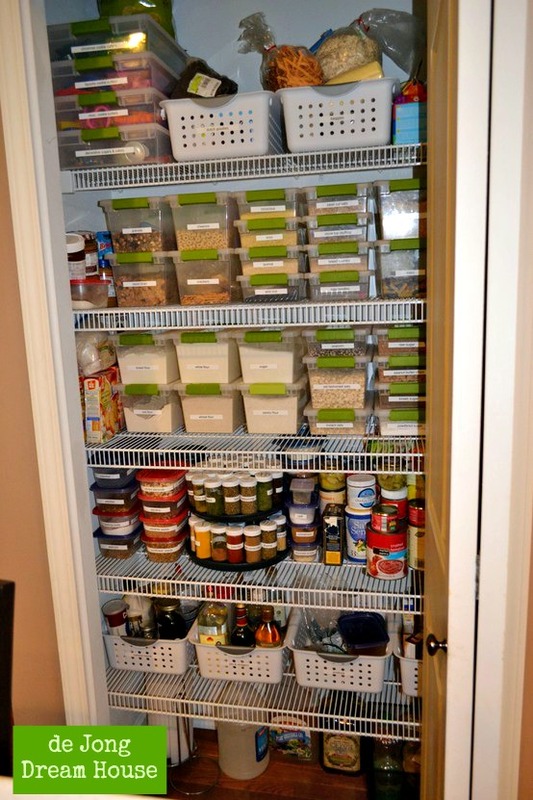 We found a local bulk foods market and I cleaned out my pantry to accommodate bulk bins instead of boxes. Organizing my pantry was a process. I started with three or four of those green clip boxes from Target for sugar, whole wheat flour, bread flour, and white flour. After that, every time I bought a new bulk item, I bought a new clip box. For smaller items, like nuts and seeds, I used Gladware containers. The white bins I bought at the dollar store. Not only did it become really easy to see which items I needed to refill, but my son learned to identity foods, not brands. 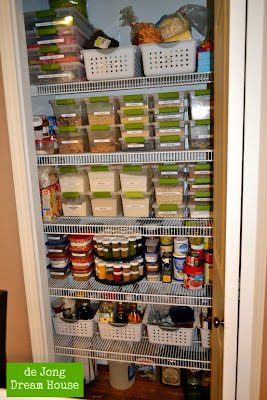 As pretty as my old pantry was, I realize now that plastic containers are not best for food storage, so I'm slowly transitioning to glass containers.. (Now you know what to get me for my birthday!). I'll be re-purposing the clip boxes for D's toys and art supplies. When D started crawling, I started thinking about what chemicals were in our cleaners. As our cleaning supplies were used up, I started buying replacements from Seventh Generation, Meyer, and Green Works. Until I learned about making my own, that is. Now, I make my own all-purpose cleaner, foaming soap, air freshener, produce wash, laundry soap, dishwasher detergent, and rinse aid. In fact, I'm learning that almost anything can be cleaned with some combination of vinegar, baking soda, washing soda, peroxide, lemon, Castile soap, and essential oils. Somewhere along the line, we started using cloth to clean instead of paper products. I'm not sure how this started, and wasn't even really aware of the transition until my mom came to help me pack up the old house and I had to look around for a roll of paper towels. Even with what my mom used, I think we've had that same roll for two years now. Since moving into the new house, I stopped buying cleaning wipes. It's been easy because our quartz counters only need a wet soft cloth with a drop of dish soap to stay sparkly clean. We put a second laundry room in the mudroom between the kitchen and in-law suite. The original thought was that if company came, or our parents stayed extensively, they could do their laundry without going upstairs. As it turns out, we have about three places where we keep kitchen towels: both sinks and on the recycling center pull. I put the dirty linens in the laundry basket each night and once a week, I do a load of laundry. Easy peasy. Speaking of laundry, because I'm cheap frugal, I've rarely bought new clothes for D. There are many great consignment sales around here, and until he stays a consistent size, it doesn't make sense to buy him new clothes when we can buy nearly new clothes for much less. Many of my own clothes are bought at thrift stores as well, except for a few nicer things for when I'm out. We also buy many of D's toys second hand, and look for toys that are made out of wood and other natural materials. We limit his noisy toys as well, because that's good for mama! By the time we started thinking seriously about building our own home, considering earth-friendly alternatives was second nature. And when we found a builder who shared our views, we knew we'd be able to truly build the home of dreams. Now that we're moved in and in the process of settling in, I'm facing a new set of choices. Instead of buying all new furniture and decor, we've been able, for the most part, to repurpose what we already had. Granted, some rooms are bit sparse right now, but we're also learning that clean and uncluttered is a green choice as well. We're staying away from particle board furniture and being creative as we save for solid wood pieces, like the bedroom furniture we will eventually have our cabinet maker build for us. Thanks to Pinterest, I've been starting to create my own decor out of things we already have or can easily find at the thrift store. This would be even easier if we had a rustic or traditional style to our house, but even with our transitional home, we are finding inexpensive ways to create our own art that is personal to us, like this "I love you" frame that I made for less $2 by reusing a frame I found at a thrift store and scrapbook paper and letters I already had. Now that I don't have hours per week spent on making decisions about building the new house, I look forward to making more Pinterest Projects as we make our house a home. Part of the reason the unpacking and settling in process is slow going is because I'm really thinking about what goes inside. Now that the essentials are unpacked, I find myself asking, "Do we really need this item in our house, or would we better off selling/gifting/donating this item instead?" The longer an item stays in a box in our garage, the clearer that answer becomes. One thing I've learned over the past four years, and hope comes across in the post is this: Being green is not a competition. Every green choice is a good choice. It's a process. If, four years ago, someone would have told me to do all the things I do now, I would have been overwhelmed, and likely, not too receptive. Every day is made of dozens of choices that land somewhere between green and black on the environmental rainbow. All you can do is all you can do and that's all you can do. I just found your blog from sustainably frugal's blog. I keep thinking the same thing myself. If 5 or 10 years ago someone would have told me what my life would look like I would have laughed at them, but having a little one completely changed my world view. Fortunately I am finding lots of great ideas on blogs like yours. I love your pantry, I've got a few boxes like that in there, but hadn't thought about it for flour and sugar, next time I'm out I'm picking up some more. Thanks for stopping by. I think it's easy to look at others and compare if we are doing more or less than them, but we can only better ourselves. I'm sure I'll look at this post in a few years and think, "Really Jen? That's all you did!" Pinterest and blog inspire me with new ideas every day! Thank you! I look in awe at my friends who do gardening and canning. There's always something more, isn't there? Thanks for stopping by! Thanks for stopping by! I love Houzz.